FILE UNDER: Cool As #&$@! 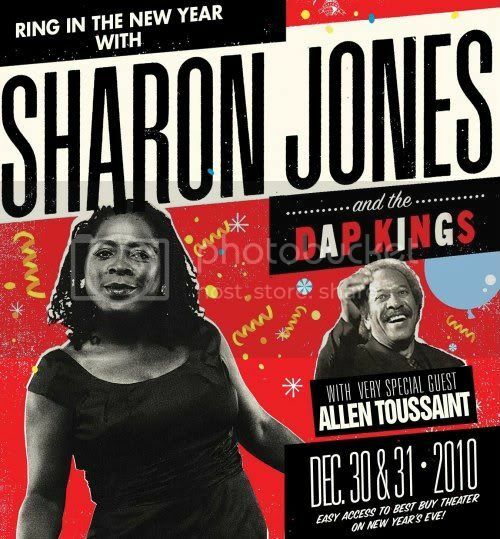 Turn the Page with Sharon Jones & the Dap-Kings in NYC on New Year's Eve as well as December 30th at the Best Buy Theater (formerly known as NOKIA Theatre Times Square), located in the heart of Times Square as they toast 2010, and ring in the new year. Don’t worry about the NYE festivities in Times Square however, because there will be exclusive access to the theater for ticket holders. Joining Sharon Jones & the Dap-Kings on the 30th and 31st will be New Orleans R&B legend, Allen Toussaint. Most recently, Toussaint and his music were prominently featured on the HBO series “Treme.” During his 40 year plus career, Toussaint has collaborated with such music giants as The (original) Meters, Ernie K-Doe, Lee Dorsey, Irma Thomas, Paul McCartney, Paul Simon, Elvis Costello, Patti LaBelle, The Rolling Stones, Etta James, and countless others.